Through vast experience and a continued dedication to innovation and customer care, we have developed a blue chip customer base. Our technical solutions to specific industrial problems have developed a unique market specialising in customising any product to meet individual needs. Our hydraulic accumulators are employed in all sectors of industry including offshore, sub sea, industrial, petrochemical, mining, mobile and defence industries. Standard bladder type hydraulic accumulators range in capacity from 1 ltr to 50 ltr with a maximum working pressure of 420 bar manufactured in accordance with BSEN14359:2006 and PED97-23-EC. Specials are also available for higher pressure, corrosive environments and aggressive fluids. Non standard options are available manufactured to PD5500 and ASME VIII Div 1, please contact us for further information. Shell Designed and Manufactured in accordance with BSEN14359:2006. Material – Chrome Molybdenum Steel. Separator Bag Totally enclosed moulded synthetic rubber bag in a range of materials. Integral steel stem fitted with gas valve assembly, sealing cap, ‘O’ ring, locknut and protective cap. Fluid Port Assembly Poppet type assembly manufactured in carbon steel To international material specifications, complete with moulded retaining ring, locking ring and bleed plug. Inspection In Accordance with PED97-23-EC. Finish One coat factory primer, or zinc phosphated. Special finishes available on request. Standard piston type accumulators range in capacity from 0.5 ltr to 80 ltr with maximum working pressures of 250, 350 and 420 bar manufactured in accordance with BSEN14359:2006 and PED97-23-EC. Special have also be manufacture for pressures up to and above 1000 bar, and options are available in stainless steel. Designed and Manufactured in accordance with BSEN14359:2006, ASME VIII Div 1 or PD5500 with approval by Lloyds Register Industrial Services, Det Norske Veritas or other approved authorities. Carbon Steel and 316 Stainless Steel materials of construction with material certification to BSEN10204.3.1 as standard. Water service ranges with electroless nickle plated wetted surfaces. Standard paint finish epoxy primer – special paint finishes available on request. Non standard sizes, designs and pressures to customers requirements. Full range of charging equipment and accessories available. Quality Assurance guaranteed by BSENISO9001:2000 approved systems. Materials held for release to machine shop under QHP management ensuring absolute traceability and total control. Standard diaphragm type hydraulic accumulators range in capacity from 0.35 ltr to 3.5 ltrs with maximum working pressures which range between 210 bar and 330 bar manufactured in accordance with PED97-23-EC. Special are also available in stainless steel. Body Steel Shell Electron Beam Welded. Non Repairable. Charging Pressure Maximum, 90% of Minimum Working Pressure. QHP can supply fully assembled accumulator stations which are ready for operation, complete with all necessary valve controls, ball valves and safety device. As well as nitrogen stations in standard and special versions. On request QHP can calculate the required accumulator volumes using a simulation programme taking the customers own operating data into account. The modular constructrion of the accumulator station enables QHP to incorporate all customer requirements. QHP hydraulic dampers are particularly suitable for damping such pressure fluctations. Selecting the most suitable hydraulic damper for each system ensure that. QHP support brackets and clamps are used to mount all types of hydraulic accumulators safely and simply, irrespective of the mounting position. Clamps, brackets and complete accumulator sets are available. The supports are designed for static use for dynamic stresses, specially designed clamps are available on request. 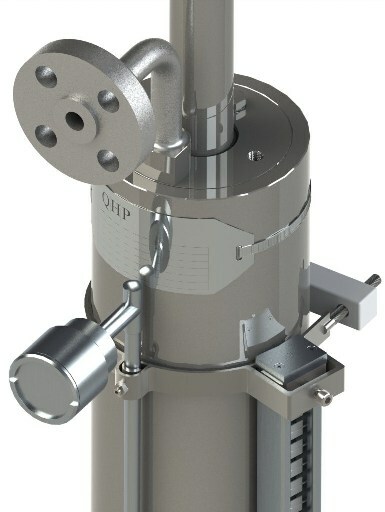 QHP are able to provide a range of nitrogen charging equipment to charge accumulators with nitrogen or to check or to change the existing pre-charge pressure in accumulators. For this purpose the charging and testing unit is screwed onto the gas valve of the hydraulic accumulator and connected to a commercial nitrogen bottle via a flexible charging hose. If the nitrogen pressure is only to be checked or reduced the charging hose does not need to be connected. The unit has a screw-type fitting with a built in gauge, check valve and a spindle for opening the accumulator gas valve to control the pressure. Nitrogen charging units facilitate fast and cost effective filling or topping up of the required gas pre-charge pressure in bladder, piston and diaphragm accumulators. They guarantee optimum use of commercially available nitrogen bottles up to a residual pressure of 20 bar and a maximum accumulator pressure of 350 bar. To provide the total package QHP offer an extensive range of accessories including portable and permanent nitrogen charging equipment, service tool kits, fluid port adaptors, mounting brackets and clamps to suit all UK and European standard bladder accumulators. Clamps and brackets designed for specific use on bladder accumulators are supplied complete with rubber supports to ensure rigid mounting of the accumulator mass (see mounting elements).